I was sorry to hear that my friend Bob Berry passed away recently. I met Bob at Critical Mass almost 20 years ago, and saw him regularly on the last Friday of the month most of the years in between. In that time, he was always upbeat, happy to see me, and full of strange stories and jokes. Bob worked at CalTrans, proving that the agency that relentlessly promotes the expanded use of the automobile had at least one mole working inside it. 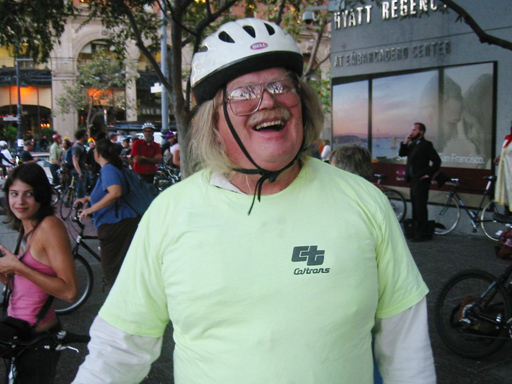 Bob was a serious cyclist, a lifelong advocate of sane traffic priorities (hint: biking, walking, and public transportation), and was never afraid to speak his mind on these issues. Bob was a “character” — an unusual, offbeat guy who took some getting used to. Once you got to know him, he had all sorts of stories about why CalTrans is fucked, why bad decisions are made there, and how the system works (or doesn’t). And he was always eager to tell stories about the Whig Party of the 1970s, (which he co-founded) and the hippy airline he once worked for (yes, there was once a hippy airline — Zoom Zoom Air). It appears Bob died of natural causes, having lived a rich, creative life. He was 62, and had one daughter. My condolences to Bob’s close friends and family. Goodbye, Bob! It was great knowing you. You’ll be missed every last Friday! hope you’re riding is good wherever you are now, if anywhere! thanks Hugh, for a fitting tribute. All good people of the Mass when they die, receive 100 brand new bicycles of every color, every style, with bells and tassels and plush seats that you can ride whenever you want to. Bob, you earned this, may your bliss expand tenthousandfold. We will miss your visits at our store and the long talks about Caltrans. Bob you were not just a mold you were outspoken and genuine human being. We will miss you. If anyone could rock a vintage Bell helmet, it was Bob Berry. Just found out and am missing him very much as SF CM 20 arrives.